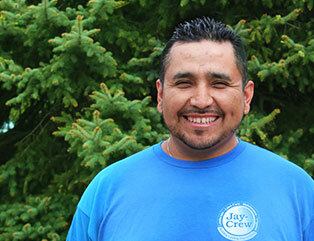 I’m Humberto, Property Superintendent for Jay-Crew. Working in the landscape industry has always been a passion of mine, and I have been fortunate enough to do what I love for over 11 years now. I am dedicated to leading my team on projects and creating a great outdoor space for our clients. As Property Superintendent, I work as a team with Jay-Crew Relationship Managers on each account to develop proactive maintenance programs that add value to each property. I am responsible for working directly with clients to ensure their expectations for property maintenance are exceeded. I direct and coordinate Jay-Crew foremen and crews, establish quality control measures, ensure a high level of service, oversee use of equipment and materials, and assist personnel as needed in carrying out their responsibilities with honesty, pride, and professionalism. I grew up in Mexico City and shortly after high school made the move to Indianapolis with my family. When I’m not working in the yard, I enjoy playing and watching soccer. I also love traveling and taking my five children to amusement and water parks.